Clark Retirement Community was founded in 1906 as a Christian-based nonprofit retirement community offering a continuum of care for independent, assisted living and skilled nursing residents. Clark began its environmental journey in 2012 by benchmarking its 262,682-sq. ft. facility using the EPA’s Energy Star Portfolio Manager tool. The building earned a score of 12 out of a possible 100 points, when compared to equivalent buildings in similar climate zones. After the initial shock passed, the Clark staff used this information as an opportunity, setting a goal of achieving 40 points within five years. Today, its EnergyStar score stands at 38 points. 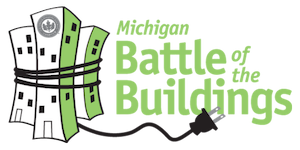 Clark has participated yearly in the Michigan Battle of the Buildings since the competition launch in 2014. This year, it reached second place in the multi-family category, with energy reductions of 10.16 percent. “We did this by practicing our “Energy Awareness” philosophy,” says Craig Courts, Chief Financial Officer at Clark Retirement Community. He cites changes and improvements both large and small, including adjusting the 40-plus Variable Frequency Drives (VFD) installed in 2013; tweaking the programming on Clark’s building management system; replacing and upgrading the pipe insulation of 1,000 linear feet of chilled water lines; replacing fluorescent lighting fixtures with new LED lay-in fixtures; and installing motion sensors in 500 feet of corridor space. In 2014, Clark hosted one of the first Michigan Battle of the Buildings program events, featuring Dr. Matthew Heun from Calvin College. Dr. Heun introduced the Green Revolving Fund concept, which involves using money saved on past projects’ utility costs to invest in more energy saving projects – essentially creating a revolving fund. Pictured from left to right: Tim Hock-Clark Retirement Community, Joel Smith-Clark Retirement Community. Clark Retirement Community has similarly leveraged financial incentives in sustainable ways by participating in rebate programs offered by Consumers Energy and DTE Energy. In 2013, Clark received rebates of approximately $150,000 for a chiller install. In 2014, the community participated in a multi-family program in which DTE Energy installed new programmable thermostats, CFL lighting, low-flow shower heads and low-flow sink aerators in residential apartments and townhomes. In 2016, Clark’s maintenance supervisor used available rebates to attend a building operator certification course hosted by the Northwest Energy Efficiency Council, which provides training and certification for building engineers and maintenance personnel.